In an apparent effort to get the United States to apologize, President Clinton traveled to North Korea and was instrumental with the release of two U.S. journalists Laura Ling and Euna Lee. He provided the apology that N. Korea required to release the two women. "Clinton expressed words of sincere apology to Kim Jong IL for the hostile acts committed by the two American journalists against the DPRK after illegally intruding into it," the news agency reported. "Clinton courteously conveyed to Kim Jong IL an earnest request of the U.S. government to leniently pardon them and send them back home from a humanitarian point of view. Originally they had been sentenced to 12 years of hard labor in the North Korean prison system for accidentally crossing over into N. Korean territory several months ago. 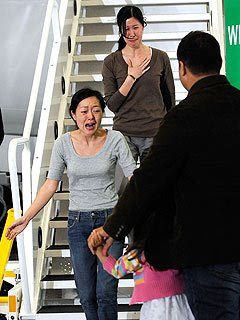 Both woman flew to Los Angeles, and the families of the two ladies are very appreciative of President Clinton, and thankful that North Korea released both of them. The deal was unexpected, as the United States and North Korea do not have any diplomatic relations with the North Korean country. Communications for their release were relayed to North Korea through the country of Sweden. This is a wonderful day, knowing that these two woman have been freed from North Korean captivity. Kim Jong II passed along information a few months back though a large network of relays to the U.S. that in order for the two women to be released, that President Clinton would have to travel to North Korea to meet with him. Once it was verified that the two women would be released if President Clinton traveled to North Korea, the meeting was set. The two women were released and flew with President Clinton to Los Angeles after 140 day captivity. Even as joyous as this return was, the Republican party has elected to downplay the return. They mock the apology that President Clinton made to the dictator leader, stating that other countries with prisoners in North Korea must be extremely upset with the way the United States handled the situation. The apology was in return for the good gesture of their release after they were condemned to 12 years of hard labor in North Korean prisons. The two journalists were separated after their arrest, and haven't seen each other until President Clinton arrived in North Korea. In an added note, because there is no formal relations between the United States and North Korea, President Obama gave President Clinton two orders that when along with him. The first order was that the statements made to the dictator did not come from President Obama, and the second order was that President Clinton was not to discuss the North Korean missile crisis with the dictator. It has been nearly a decade since the United States had offical talks with the North Korean government. It is also hard for me to believe that nuclear talks did not take place during the exchange between President Clinton and Kim Jong IL. Regardless, the two women are now safe, and it will be interesting to see if something else developes from this meeting.